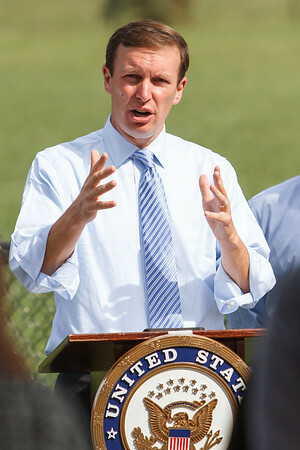 NEW HAVEN - U.S. Sen. Chris Murphy, D-Conn., recently announced that PatientWisdom, Inc., a digital health start-up, is “Murphy’s Innovator of the Month.” The company has three digital solutions to improve health care: PatientWisdom, ProviderWisdom, and Community-Wisdom. PatientWisdom, Inc. was founded by Gregory Makoul in 2015. The idea for the company was sparked almost 25 years ago after Makoul finished his PhD in communication studies from Northwestern University and joined the faculty at Northwestern’s Feinberg School of Medicine. He recognized that many physicians and physicians-in-training had very little understanding of how patients experienced health and illness, and worked to strengthen the focus on patient perspectives. Realizing New Haven was becoming a hub for innovation, Makoul decided to start PatientWisdom near Yale New Haven Health, which has since become a strategic partner. PatientWisdom provides patients, families and caregivers with the platform to share brief ‘stories’ about themselves, their health, and their care. PatientWisdom then runs analytics to distill information about what matters to patients. Over 90 percent of patients report that PatientWisdom improved communication with providers who used it, and over 80 percent of providers confirm that PatientWisdom helps them learn what is important to their patients - in less than 20 seconds. “Greg’s innovative vision is a great example of what happens when you use technology to actually listen to people. Patients who use PatientWisdom are finding it easier to communicate with their providers, and doctors are better understanding the needs of their patients. I’m looking forward to watching this company grow,” said Murphy. Posted in The Bristol Press, General Business, Manufacturing on Monday, 3 September 2018 19:36. Updated: Monday, 3 September 2018 19:38.